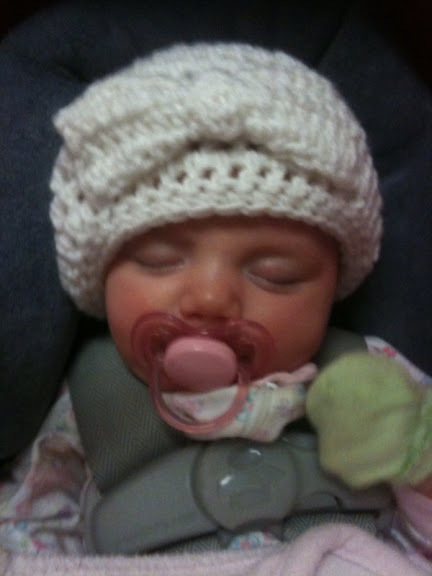 After I posted the pictures of the hats I crocheted, my sister Amber requested that I make a minnie one for her niece. Despite being unsure of the size of a newborn's head, I went for it and this is the result, and I have to say it has to be the cutest thing I have ever seen!!! I am pleased with my work, and it looks like she has room to grow into it as well. p.s. Stacy, I hope you don't mind that I posted this picture. It's not only cute it is practical for keeping her head warm! I don't mind at all but I would have gotten a picture without a big carseat buckle in it. The size is great and she definitely has some room to grow into it too. It is super warm and matches everything! Thanks so much. Okay, seriously you are so talented! This type of project would take me months! I love it!! Melody, this is soooo adorable! You should consider selling them or something. I so want one for Kelsie! omg, can you make me one for my lil babe on the way in 4 weeks? I'll pay you! It would be perfect for the cold weather next month. let me know of fb.